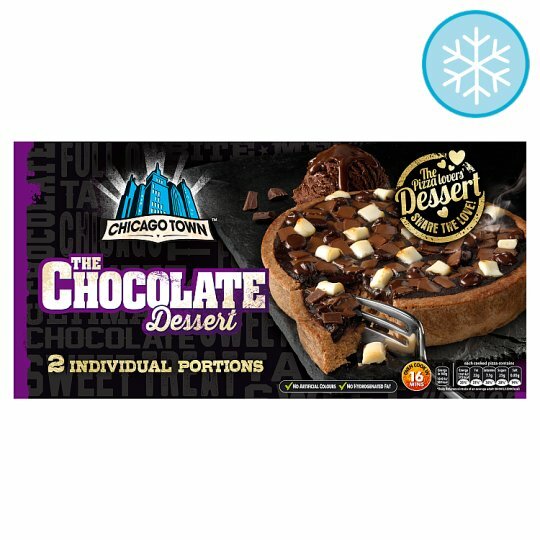 Chocolate flavoured deep dish pizza base topped with chocolate flavour sauce, a blend of dark chocolate chips, white chocolate chunks and milk chocolate stamps. Delicious chocolate pizza topped with gooey chocolate sauce, dark chocolate chips, milk chocolate pieces and white chocolate chunks, on our signature chocolate crust. The pizza lovers' desert share the love! Keep frozen and store flat., Do not defrost., Keep at -18ºC or cooler., Best Before End See Side of Pack. Oven cook (From Frozen): Product must be cooked before consuming. These are cooking guidelines only. Product is oven cook only, not suitable for microwave cooking. Keep pizza frozen until ready to cook. Place the pizza directly onto the middle of a pre-heated oven. Check the pizza is hot throughout before serving and that the topping is melted.